Not just any noisemaker, though. How about at least 50 of them? And branded — with the name of your restaurant. You have to imagine that New Year’s Eve is a tremendous night for many restaurants, clubs, and bars for good reason. People want to party. And still many people enjoy partying at the best joint in town, whatever that joint may be. So one way a restaurant can promote with the best of them is branding noisemakers for all and giving them out as gifts! A Noisemaker for EVERY Employee. And EVERY Customer. The great thing about New Year’s is that it makes people want to party for a very long time. When you encourage that, you encourage longer times for customers to stick around order more drinks. So this isn’t just about enjoying the new year, partying, and having fun while your employees — and yourself, possibly — have to stick around and work! It’s true: restaurants stay open on New Year’s. Sad for those bartenders, waitresses, and managers. But if you’re an owner of a restaurant, or restaurant chain, investing in a custom noisemaker by the hundreds not only can keep customers, but also keep employees wanting to work! Decreased requests for the night off. More excitement and motivation. Your bartenders then love to come in. It becomes fun for them to make those drinks, schmooze with the customers, and make a little noise as well in the process. Plus that noisemaker your one bartender or waiter has is branded with the restaurant label. Instant marketing and promotion. And the restaurant business is notorious for that. There had to be a way to promote their work for our entertainment, and a simple noisemaker gets them all off on the right foot to make noise and celebrate while working. You can’t beat that when you have BRAVA Marketing to hook you and your restaurant up. Just contact us right now! And check out all our selections. Make your restaurant PARTY PLACE 101 for the holidays right now. What’s the one thing employees and execs love about doing business? Holidays. As in holiday parties! And the best holiday party a business can throw right in the office is the one on New Year’s Eve. Probably second best would be Christmas. Here’s the thing about New Year’s, though — you get to make noise. A lot of noise. And nothing says employee morale like getting out some custom noisemakers, offering them as gifts, and promoting the reputation and longevity of your business. Of Course, It’s Not Just About Pleasing Your Employees. Branded Noisemakers Can Do so Much More. Think about it: the end of the year usually should mark a celebration of success for a business. Taxes, year-end numbers, revenue, profit, ROI. When a company celebrates the New Year, that company celebrates success, and that not only makes employees happy, but keeps them working. After all, no employee wants to work for a company that isn’t doing well. For businesses, it’s always been different. New Year’s for individuals is all about starting over, beginning anew — whereas businesses think of getting better. Bigger. It’s not a rebirth or restart. Rather, it’s a coming of age, a reminder that business is going well, and here’s a little something to celebrate the occasion! Make. Some. Noooiiiiiise! With custom noisemakers! It’s not inappropriate, as you may think. Quite honestly, more businesses should do it. It’s one night a year. Set up a lock-in with your business, have your employees invite significant others (probably no kids), dance the night away in the conference room, cater, and then do the countdown. Can you imagine the amount of employee morale? It would skyrocket. And the branded noisemakers would be the cherries on top. So What Are You Waiting for? 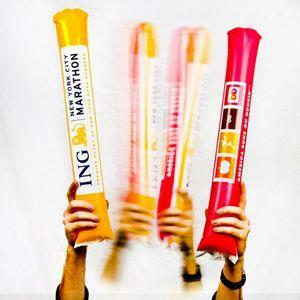 Sign Up With BRAVA Marketing and Get Some Custom Noisemakers Right Now. You can check out the selections we have immediately. 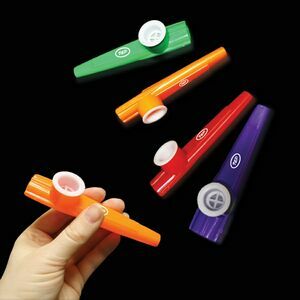 Kazoos, regular paper products, what have you. Whatever style you want. BRAVA Marketing has it. When you’ve found something that’s to your liking, all you need to do is contact us here. And we’ll get you all ordered up. Sound good? Now let’s party.